As Where to Find Me opens, sweethearts bicycle along the Seine, write poetry on bus tickets, gaze on Jean Paul-Sartre at the café, dance to live Jazz. Alba Arikha’s Paris is redolent of golden sunshine, rich scents, and richer sounds. Soon, like an old photograph beset with creeping mould, the picture darkens. Their religions part the lovers, Hitler’s troops march into Paris, and the Parisian Holocaust begins. 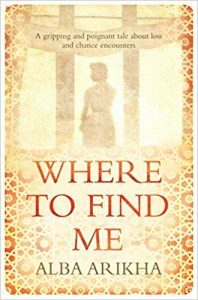 Where to Find Me is Arikha’s fifth book. Her previous publications have garnered her accolades for her lyrical quality. Arikha’s youth was blessed with intellectual and artistic abundance, tempered by an emotional shortfall, a recurring theme in her books. 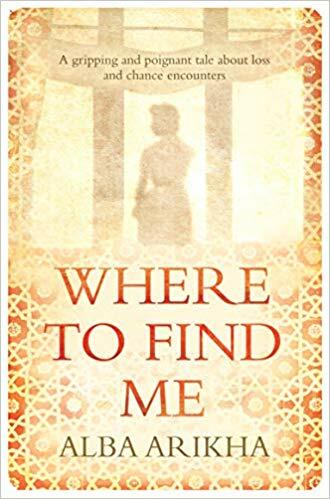 Here, she explores our ability to curtail emotional fulfilment through withdrawal from interactions and raises questions surrounding fate vs chaos, and the dangers of limited knowledge. She weaves the threads of her themes through the unrelated, yet fortuitously linked stories of Flora and Hannah. Here is the nub of the book. Flora’s reticence keeps her safe, but lonely. She fears to expose the sensitive pink tissue of her soul, and she is the poorer for it. But, she harms more than herself. When she flees, she denies Hannah solace during a tumultuous time in her life. Hannah, robbed of a mentor, matures into a similarly barren person. Until she chances a meeting, much as Flora once did, and her life blossoms. Hannah’s growth in the arms of her lover, is not complete, though. Flora’s journal affords her a path. In taking the leap Flora herself was too damaged to make, she saves herself, Flora, and the child Flora never had the courage to find. For all the delicacy with which Flora is drawn, Hannah seems a rough sketch. There are some points of logic which don’t tally, but the book has given me much more to ‘chew on’ than it does to criticise. It considers the dilemma of safety over courage, the dangers of viewing ‘facts’ through a fissure of the past, of the creeping poison of good people unwilling to act out of denial or fear, and of inevitability.